Vic Law dribbles up court. The senior forward finished the game with 14 points. 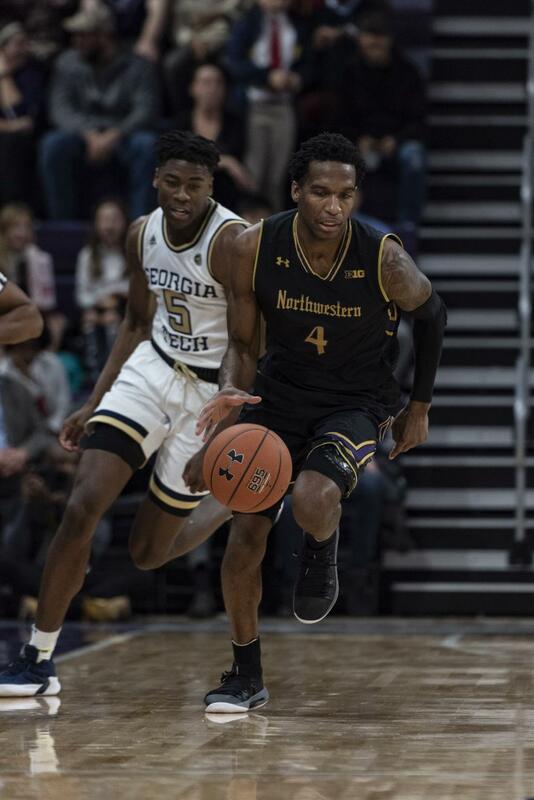 After losing in heartbreaking fashion on this same date to Georgia Tech, Northwestern entered Wednesday’s contest looking to avenge its loss. The Wildcats did that, and some, running past the Yellow Jackets, 67-61. In front of the biggest crowd at the reopened Welsh-Ryan, NU (6-1) opened up an early first-half lead and led by 10 points just after the 10-minute mark. Instead of relenting, the Cats continued to extend their lead. A three-pointer from sophomore guard Anthony Gaines as the buzzer sounded at the end of the first half put an emphatic exclamation point on the best half of NU basketball this season as the Cats entered the locker room up 20 points. When NU returned, it kept up the impressive pace and stretched the lead to 28 points. However, Georgia Tech (4-2) went on a 25-7 run to cut the deficit to 15 points and continued to fight. With under a minute left, the Yellow Jackets cut the lead to seven points, but a jumper from senior forward Vic Law put the game out of reach. Georgia Tech made a few shots at the end to cut the final lead, it was too little, too late. 1. This is Vic Law’s team. If there any doubt before today, there should be none now. Law opened his final campaign in Evanston with some big games and Wednesday was just another example of the evolution of Law to becoming one of the best players in the Big Ten. In the first half, the senior forward had 10 points and six rebounds while playing solid on-ball defense and helping to open up the Cats lead. Following the intermission, continued playing well, but did not assert himself as much on offense and the team suffered because of it. He did hit a jumper from the elbow with under a minute left to put the game out of reach. The one game NU lost this year was the worst game that Law played. For them to continue to win games, Law is going to have to keep playing at such a high level. 2. Ryan Taylor is finding his groove. Taylor had an up-and-down first few games but the last three days he is finding his flow in the NU offense. Against La Salle on Friday, Taylor had 21 points and then had 14 points against Utah. However, in both those games, he struggled from beyond the arc, shooting 5-for-20. That was not the case Wednesday. He finished the game shooting 4-for-9 from three-point terriotory to end with 20 points. At the end of the first half, the graduate guard hit a step-back three following a between the leg dribble with the shot clock winding down. Then, early in the second half, he hit a pull-up three-pointer off the dribble before hitting a trey ball in transition the next position. Those are shots only a player with confidence in himself would take, which is something Collins will hope only continues to grow. 3. This win has major implications for NU’s resume. While NU finished with a winning record at the Wooden Legacy, its loss in the opening game of the tournament to Fresno State resulted in the team missing out on an opportunity to play and beat 2018 NCAA Tournament teams Miami and Seton Hall, which were potentially big resume-boostin wins. Even though Georgia Tech has not made the NCAA Tournament since 2010 and is not at the top of the conference, a victory over an ACC always looks good on a resume. Obviously, having a 28-point lead cut to only a 10-point advantage is not ideal, but does not have as big as impact as one might think. In the new NET Rankings, margin of victory is capped at 10 points. So even if the Cats had held their lead at almost 30 points, it would have made as big as a difference in the ranking as one might think.